Do you know Luís Vaz de Camões (also known as "le Camoëns"), the most famous poet and writer of Portugal? I did not! But now that I have seen the monument dedicated to him off the boulevard Delessert in the 16th arrondissement, near the Trocadero, I do. He was the "Shakespeare" of Portugal and lived approximately between 1525 and 1580. "His avenue" is beautiful, and obviously a pedestrian area (as far as know it's the only pedestrian avenue in Paris) as you can only walk the stairs in it. A very romantic image that you have posted today. Ahh Paris! This is a beautiful monument - I love double staircases. It must be so great to have lived in Paris as long as you have and then happen upon something as incredible as this! Beautiful stairs! I love your angle, too, Eric. Does anyone know of a book of Parisian staircases? We have a San Fran one. The city named one of the stairs after the author as a thanks. I do know this avenue! 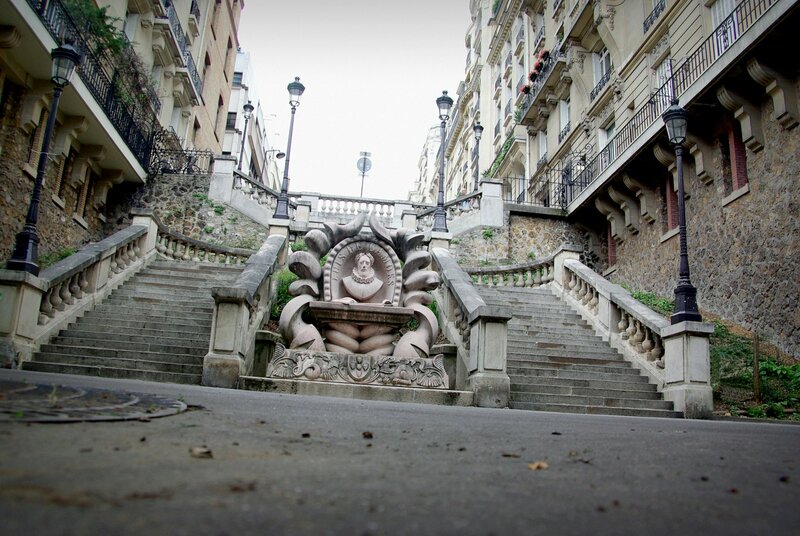 Wandering, in the night, not knowing where I was, I turned right into a street that just ended at the top of these steps. The sparkling Eiffel Tower, hidden before by the apartments, emerged suddenly huge and beautiful across the river. And, when I got to the bottom, this sculpture greeted me. Walking to my left I picked my way through the heavy darkness of a park, and then, the Trocadero sprang alive out of the trees and bushes to my left! Magic!! Thanks so much for the memories, Eric!!! @ETSuzy - If there's no such book, Eric should do one - I'm sure it would sell! Sorry if this is off the topic of Portuguese-poets-loved-by-the-French but I wanted to share some Francophile film info: 1st FilmsdeFrance.com is a great resource (esp for Netflix lists) and for this month, Louis Malle's 1966 documentary on the Tour de France (avail on Netflix) and Jean Gabin's Grand Illusion out now in US theaters in a newly restored version. Run and see it!!! There's no place like Paris! Since Brasil was a colony of Portugal, he´s very famous and admired here. This avenue is soooo beautiful!!!! There are endless beautiful places to visit in Paris.. Thanks for showing us ALL of them! Very poetic! I love it! Killin' me, just killin' me. Fascinating history! And love that Tenin perspective! Paris and all its spectacular nicks and crannies, you bring them to us with such style, gorgeous photo! @Tonton "Great shot of this fascinating bust. I am sure the people who could afford to live here never had to carry their groceries and wine up those stairs...now, that would be brutal! LOL!! Still lovely though..."
Well, yes, it's not exactly the poorest area in Paris! I lived in the 16th once upon a time (even though I was very poor! ), but I've never seen this—thanks for teaching me something new yet again, Eric! & @ET Suzy - If there's no such book, Eric should do one - I'm sure it would sell! Funny you mention that, I'm actually working on a PDP book... Stay tuned! @]Alexa "I lived in the 16th once upon a time (even though I was very poor! ), but I've never seen this—thanks for teaching me something new yet again, Eric!" Which part of the 16th did you use to leave in? There are two parts in the 16th, the "lower" part (post code 75016) and the upper part (post code 75116). The upper part (in which this avenue is of course) is supposed to be more chic - and much more expensive. Carrie, 'Wandering in the night, not knowing where I was' - Yup, I've been there, too many times. As it happens, I've been to this place as well. The other thing I remember - it was raining. Not much changed then. @Eric Tenin - Funny you mention that, I'm actually working on a PDP book... Stay tuned! That's at least two books you've sold already, Eric: Suzy's and mine. @Petrea "That's at least two books you've sold already, Eric: Suzy's and mine." You're nice! Actually I'm wondering what format, how many photos, how much text, etc.? I'll probably run a poll! Eric - that's so exciting!!! I'm buying, too! I wish you the very best of luck in preparing it. Well, here are my two cents for your poll. I think you already have multiple books in PDP photos. I think you could do themed books (by topic or B&W, etc), if you could get the deal, to be released each Christmas, with title and cover continuity. Pick a theme where you have enough for the first volume, then, if you don't have enough photos for a certain theme, you'd have a year to supplement. Knowing people who've gone through the sorting/creative process, some are tempted to only choose the very best work for a single book. This is one strategy, but it can also be a setup. One can mistakenly start to feel that anything less than the best is not good enough when that is not true. The next tier down can bring much joy to many people and broaden one's material significantly. One can always do a 'best of' book later! I think less text is more unless you want to tell a story or tie them together. I also think smaller is easier to sell in these tough times. Eric, I just like this photo. Book, no book--whatever. I like the angle, I like the double staircase (they seem so rare nowadays), I like the lighting and the architecture. The fascinating part about what you do is that no one knows what tomorrow's picture will be. The heart and soul has to do with how you make us feel when we view Paris through your eyes. It's a cool feeling. Gorgeous. So happy I have found this site. This place is for sure being bookmarked. I am making a list of more off the beaten path things to enjoy on my next visit to Paris and your site is giving me quite the list!